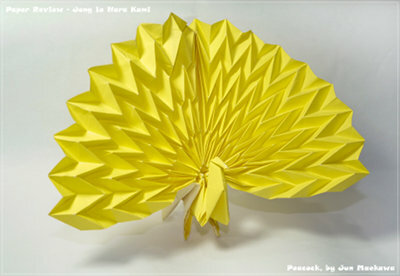 Kami is simply the word for paper in Japanese, but in the last fifteen years or so it has come to mean 'ordinary' origami paper, the type that can be bought pre-cut in squares everywhere. 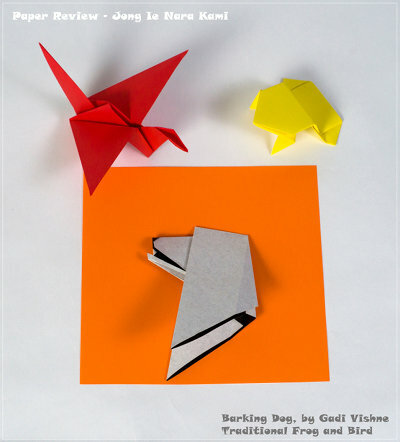 Unsurprisingly it is the most popular paper for origami and needs little introduction. However there are many, many producers of the classic square, with color on one side and white on the other. For example, the OUSA carries the Toyo brand, distributed in the USA by Mountain Valley Paper company, and available on The Source. 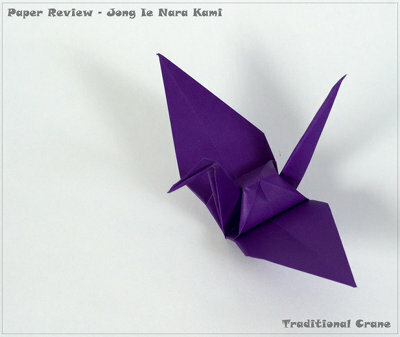 But since we cannot review them all we chose to review the paper by Jong Ie Nara (JIN), a South Korean company. 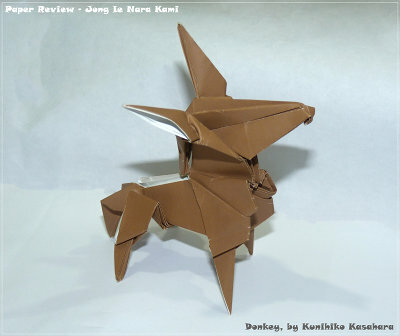 Jong Ie Nara, which means 'Paper World', was founded by Dohun Jung In 1972. Looking through their website you can see that they truly follow their motto: "Let's make a beautiful world together with Jong Ie Nara". 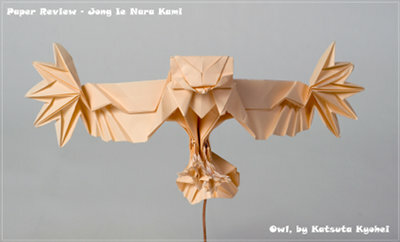 Their products can be found in over 68 countries and in December 1998 they established the Jong Ie Nara Museum for paper art. Their catalogue is immense. 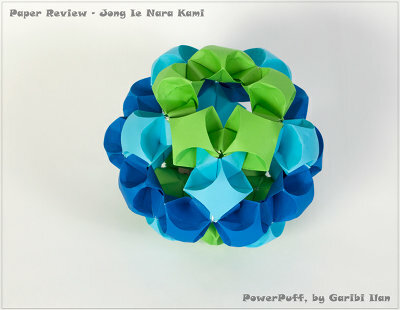 I went to look in my 15 cm paper drawer (yes, I do have a drawer for every paper size) for some to fold, and I found Pearl paper, Hologram paper, Duo papers, Melody and many more by JIN, but in this review we are going to focus on the basic product - simple, color on one side origami paper. For the complex models and tessellations I found an old packet of 30cm paper which is not in the catalogue any more, but still can be bought in BOS supplies. For all the others, 15 cm was sufficient. 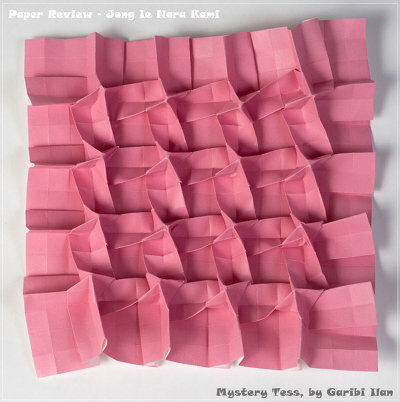 Four years back, I had the notion that the best paper for my early attempts with tessellations is Kami; it must be called Origami paper for a reason! I was surprised to see it didn't really work. Today, with more than hundred paper types in my collection, I am older and wiser, and will try to see what it is really good for. Thickness: The measured weight is 63gsm, while they state it is 60gsm. The thickness is 72 microns, somewhere between Japanese Foil (50 microns) and Printer Paper (105 microns). 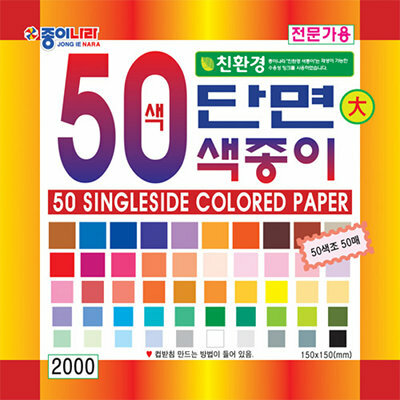 Colors: Most packs contain the 10 to 12 generic colors (blue, green, red, yellow, black, etc) with strong hues, but there are packs with 36, 50, or even 200 colors. If you include pattern variations, the choice is even wider! Paper Coloring or Colorability: You may ask , "Why would you color Kami?". For some, having exactly the right color is important, or you may want to color the white side. The moment I applied water color by Ecoline, the paper curled a lot, but when dried, and it was dried in less than a minute, it stays as flat as before. There is a tiny change in proportions. Some of the color seeped through to the other side, but besides all that, the result is very nice. It has a silk-like look. Texture: All papers are smooth to the touch. Some colors have a plastic feel and look to them, such as the grey and light brown. The red paper will turn your finger red. The color is spread quite even, with drops of amoebas shaped water marks spread over, which are hardly visible. The paper has a little shine to it. Photogenic: Now, this is really a matter of individual taste. The strong colors, the smooth surface, no real texture; all together may look dull. The white side appears where it shouldn't. For me this is not good enough. Aging and Wear and Tear: The numbers from the test machine are similar to those for Printer paper - 500 and 520. But as kami is thinner, it is relatively speaking stronger and more tear resistant. The paper is acid free, which should promise little change in color through the years, as some of my 3 years modular models prove. 8.5 out of 10. Memory: Good. Reverse preliminary fold into a Waterbomb base and the paper springs happily into the new position. Reopen a crease and you can see and feel the bump. 8 out of 10. Forgiveness: Good, almost very good. There is no problem in reversing a fold. 8 out of 10. Tensile Strength: We refer here to the maximum stress the paper can undergo while being stretched or pulled. With the grain, the paper can hold up to 6.1 Kg before tearing; but only 2.2 against the grain. It's again very similar to Printer paper. 7 out of 10. Bending Resistance: This section rates the amount of force you need to apply to get a sharp crease and how strong the paper is while being curved (like during the puffing of the PowerPuff unit). This brand of Kami is stiffer than most. It curves nicely and you can easily feel the grain direction with your bare hands. All in all - good. 8 out of 10. Convention shops of CDO, Pajarita, etc. Simple models don't ask for much, and this paper is just what is needed. With a model comprising few layers and a simple folding procedure, Kami is just right. There is, however, one issue with this Kami. Usually, during the folding of the crane, the model lies flat, but not this time. Annoyingly, the sides of the head tend to curve . Maybe it's because of the semi-plastic coating? The JIN Kami is stiffer than usual. All in all, action models work very well. 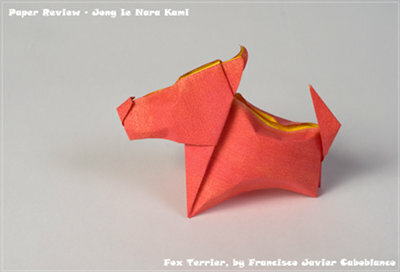 The black nosed dog barks again and again, showing the flexibility of the paper. The red bird flapped perfectly - usually one wing tends to be higher than the other, but here it was perfectly symmetric. The yellow frog jumps nicely, but not as high. But it makes many somersaults. While folding is surprisingly easy, the result is too common, and white corners make it unclean. Back light highlights the fold lines. I chose red. In my experience, red Kami is usually thicker than the rest of the pack, but not this one. While folding the grid, you can feel how soft the paper is. Using a bone folder, the color vanished from the crease line, leaving a white line and red fingers. The creases are easily visible on both sides. Precreases are easy to fold, although the lack of surface tension makes it harder to make a diagonal crease on the grid. During the collapse you get the feeling this paper is gentle and fragile, but still the paper 'breaks' in the right places and thanks to its thinness the layers fall exactly above each other. The final result is clean and sharp, more accurate than most papers I used, and if not for the white points in every corner (where the red just scraped off), it looked very good. With back light the crease lines become transparent, giving the model an interesting look. The paper is too soft for this model. I chose the pink paper. Grid went well, and since this model has no pre creases, I went on to the collapse phase. At this stage you need some resistance from the paper, but this one is too soft. I had to use the sharp edge of my bone folder to flatten misplaced layers, and I tore it in one place. Shaping the tip of the pyramids, once again I realized how weak this paper is. The final result is not bad, and unusual (a pink tessellation, imagine that...) With backlight, as always, it's better. The surface is broken, making the model look bad. I chose the grey paper. The color gives the paper some elastic behavior. The paper is smaller than I normally use to fold this model, but it's also thin, so there is no real problem here. I used a bone folder to strengthen the creases and the result is fine. I had very little problem with the open and close sink (step 37). I even managed to have sharp ends with the legs, but maneuvering many layers (folding the breast at step 85) is difficult. I needed to apply force with my fingernails to ensure that all the layers went into place and stayed there. 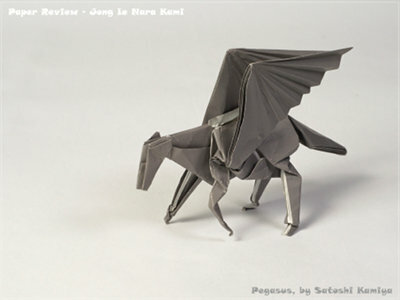 The final result is good, the flying horse stands steady, and the wings are stable. A decent result with Box pleating. Box-pleating until the base was made was surprisingly easy. The elastic coating gives the paper the surface tension it needs, so it just snaps into place. Shaping the legs and talons requires more determination than usual, with many sinks. Reversing a fold is done easily with this paper, so forming the wing tips and feathers went well. The perfect candidate for Kami! I chose 3 colors, dark blue, light blue and green. Modulars should be the bread and butter for this paper, and it is. It's easy to fold, even with the issue of not going flat (see crane) It just works well! Reversing is easy, and for the puffing the paper is stiff enough at that size to hold the rounded shape very nicely. Still, some of the units gave me a fight. For assembly, the stiffness is very helpful. The final result is stable and easily holds its own weight. The rat cannot stand on its legs, the white side id highly disturbing. This model was very easy to fold. The paper is thin, yet strong and stiff enough to do reverse folds. During the folding sequence the paper behaved like high end papers, but when finishing off you can see how simple it is. The legs are too weak to hold the complete model. Coloring the paper improved the stiffness of the paper. This lovely simple model was folded in a flash, and from a smaller than usual square. Nevertheless, it was shaped very easily, resulting with very nice 3D effect. The paper may be a bit stiffer being hand painted, yet still I was surprised and enjoyed the final result. A reasonable result, no more. With so many layers, this was difficult to fold, but this paper is thin enough to cope with this task. The paper is not flexible, and if you miss a corner while making a crease, it's hard to fix it, if at all. Here, too, the legs are not strong enough to hold the donkey. For this type of models - it works very well! 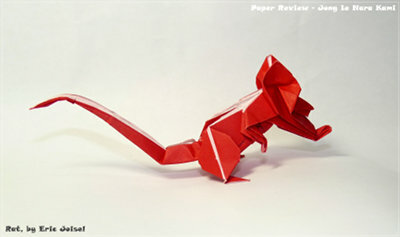 After the rat and the Donkey, I realized this paper is good for low-complex models, with many reverse folds. I chose this peacock and wasn't disappointed! The folding just went well and I was happy with the results. This summary must start with a sigh. 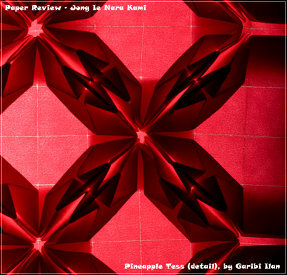 Yes, it is the most popular paper for origami. For simple models, simple action models and modulars it is almost perfect. Yes, it's all true, but it does have a major flaw - it looks too simple. 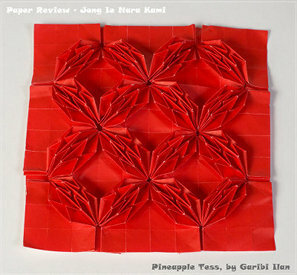 Tessellations went better than I thought, and I am surprised to say, it is a good paper for such. 3D models went well, and it's even good enough for high intermediate and low end complex models. And here comes the big 'But': It doesn't look good. The white side is all too visible, it can even be seen through cracks in the colored side. The strong, unnatural colors, the smooth and dull texture - does one really want to put so much effort in a complex model that doesn't look that good? Still, there are modulars, and for those this is a very suitable paper. Here, using the small sizes and packs of 1000 sheets, you can fold and fold and fold, and be happy with what you get. A word about this particular brand, since this is not a comparative test of many Kami manufacturers. We chose this brand for being accessible, with good cost benefit ratio, and we think it's got a good spot in the center - you can find some high end Japanese papers which are better, and sadly to say, too many with much lower quality. In Flickr 2,165 results show the popularity of this paper. Many (I couldn't count...) are modulars, and simple animals. Here and there I found a tessellation, but rarely a complex model. Bottom line: simple, too simple. They are good with Modulars and the large variety of colors Is useful.